Music study is not difficult — but the results can be profound. Even life-changing. Gratefully, when we homeschool we have time to study music and the arts. I know — you may not think you have time, but you do. Listen during chores, lunch, or while you are cooking. Like so many things, it’s not how much time you spend on music study, it’s the frequency of the time you spend. The minutes add up! What an incredible power it has to inspire us. Not only has this been documented by others, we have often experienced the effects of music ourselves – lifting our spirits when we are down, energizing us when we are weary, bringing us closer to God in worship. With such a proven and profound influence, music certainly should be a part of our children’s education. Charlotte Mason thought so, too. In the past, one was not considered educated without an appreciation and ability to recognize the more common composers and pieces of music. For all or any of the reasons above: music study/appreciation should be part of our students’ education! What Does Music Study Look Like? You don’t have to buy a special curriculum or or make detailed plans to “teach” music to include music study in your homeschooling . Thankfully, you don’t have to play an instrument yourself or be trained musically to enjoy and listen to excellent music, either. You may read a book on the composer’s life. One book written from a Christian perspective that might be fun to read to your children as you listen to music is Spiritual Lives of the Great Composers . Make it a daily habit to listen to a particular piece of music for one week when you are accomplishing other tasks– upon rising, at meal time, when doing chores, when children are getting ready for bed, etc. You may incorporate Music and Composer Study into history, as we do with our curricula, studying each composer and listening to his* music as we learn about the time period in which he lived. *Did you know there were also female classical composers? This subject begs to be researched further – perhaps by your high school student. How Do I Make Sure My Students Are Engaged? Is this music fast, slow, in between…? Can you hear any of the instruments that were played in this music? Do you hear any parts of this music that are repeated? Consider using resources to learn a little about the fundamentals of music theory. Have your students complete a lapbook about different musical instruments or their favorite composers. Provide instrument lessons for your students. We have included the historical period of the music/composer if you are incorporating music/composer study into history, like we do. A few resources we have enjoyed are also provided. Both the CD above and below feature Gregorian Chants. The first one is solely male voices, while the one below includes male and female voices. This includes several of the works of Martin Luther with his words interspersed. 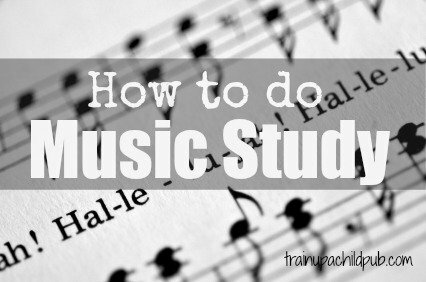 Do you do music study in your household? How do your children respond? Nadene, Thank you for watching the video! It was so inspirational to me that I really hope people are taking the time to watch it. And it underscores the importance of music! Incidentally,I started the video sometime after the beginning to make it less time-consuming to watch, so you missed the part where the gentleman’s daughter was interviewed and she said he had always walked his girls to school and they sang and danced all the way. She likened it to Gene Kelly’s ‘Singin’ in the Rain.’ What a precious memory. Yes – the Charlotte Mason approach allows for a much better understanding of history and people when studied in the context of their time periods than a more isolated, traditional methodology of teaching and learning. Ellen, everything is easier when the kids are younger and more of a ‘captive’ audience. 🙂 Sometimes it’s easiest to work the listening part in over meals or chore times. Interestingly, my son took a music appreciation class at college and they had to analyze music, write about it and learn to recognize MANY pieces of music. He aced it. What a lovely introductory video – it demonstrates the simple yet powerful connection to music. I’m often surprised how my children relate their music appreciation lessons to movies! They have so many soundtracks built in their memories. With a CM approach, I feel that I am filling the history and authentic details to the composer and his life and era. Dana, I very much enjoyed your post. This is an area in which I’ve been slack in the past year. When the children were younger, I was diligent with music/composer study. Now that they are older, they complain (loudly), and I let it slide. :-/ Thanks for the encouragement. I also appreciate the listing of composers in historical era format. Blessings! Thanks so much, Mary! So glad to hear you will be sharing my post! Feeling so much responsibility to thoroughly educate our children in the academic subjects, many of us homeschooling moms tend to leave out the music and art studies, which are important as well! I think that is what first appealed to me about using a Charlotte Mason methodology in our homeschooling. Thanks for stopping by!